Thought I'd take the stadium news out of the general thread and give it it's own. It's official, Michigan will get it's first pro-soccer team, and it will be in Lansing. Hopefully, the community supports it. Cool! 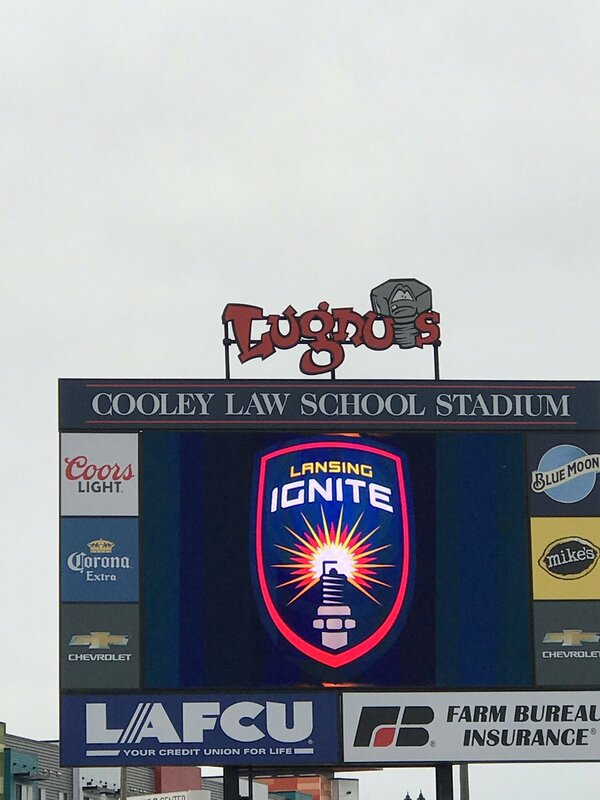 "Lansing Ignition" would be cooler, as it would tie closer in to automobiles. I'm not sure what they are trying to associate "Ignite" with. A spark plug. It's in the official logo. Like the Lugnuts, it's a play on our automotive heritage. Okay cool, yeah similar to Ignition then. I didn't see the rest of the logo so I thought it was just a flame or explosion. I like the distillery. That whole Pere Marquette block is great. I hope Gillespie doesn't turn the old train station into a multi-colored club for cheeseballs. I think the Meijers development will be a huge success for the eastside.....though I hope they're still tinkering with the design to make it the best it can be. Soccer at Lugnuts is a good thing. I'm not a huge fan of the apartments built into the stadium. I think the idea is good, I just think the lego building looks stupid, it's colors are distracting (why not use Lugnut colors, Mr Lansing???) and it's not big enough for all the effort it took. There was a previous design for a six- or seven-story building in this location that I think would have been much better....and would've also added to the skyline. That Lansing Brewery is probably a good thing for the area. But again, it is over-the-top and seems cheesy and trying way too hard to be "authentic" or whatever.... frankly, it overshadows what was previously a very nice (though perhaps underused) part of town. I liked when that smaller bar was operating on the north side of the street (mostly black patrons the times I went there), the bike shop was running, and seemed like there were active offices in that beautiful old house. I think that might be a Darius Moon house?? ...I didn't even notice the house when passing by with all the visual noise of the brewery. I read that a new group will be operating the rescue mission on Larch. Really glad this is happening. It's hugely important to provide shelter for people in need and this is the spot.